I really don't know a lot about it. It was always at my grandparents' house and then my mother inherited it when they passed on and it's just always been there, and she really doesn't know where it came from either. Let me tell you a little bit about it. 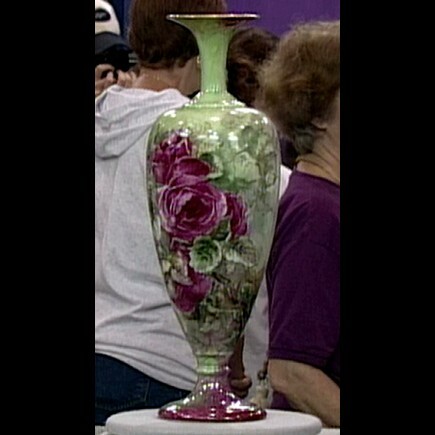 The first thing that I do when I look at a vase like this is look at the decoration and the form, which is really striking and quite large. 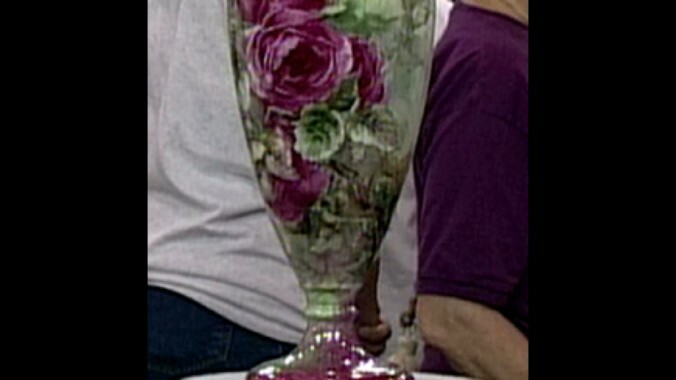 It's a very interesting shape, but the mark is going to tell us a lot about this vase. There is a green mark on the bottom. There is a painter's palette with, like, an artist's brush and little daubs of paint. Then there is a monogram which is "C.A.C." which stands for "Ceramic Art Company" and below that it says "Belleek." Now, normally when we see the word "Belleek" we think of Irish Belleek made in Ireland, but at one point there were a lot of companies in the United States which made things called Belleek. This was made by Lenox. Ceramic Art Company is an early name for Lenox. Lenox was started in 1889, and by this mark we know that this particular vase was made between 1894 and 1906. It's very unusual for the age, it's very early. It's got a great, bold, bright, painted pattern on it, which was very popular at that point. I suspect that this is factory painted; however, it could have been painted outside the factory. How much do you think that this might be worth? Oh, I really have no idea. Well, to a collector of early Lenox, Ceramic Art Company and Lenox today, this vase would probably be worth between $800 and $1,200, which is quite a lot of money for this sort of thing.